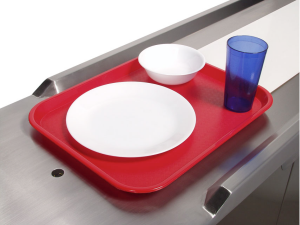 A compact Tray Make Up conveyor featuring 10″ wide, 2-ply white Neoprene food-grade belt, low voltage controls, variable speed and start stop stations at both ends. Remote Start Stop Station is conveniently located at the discharge end of conveyor to give the operator additional controls. 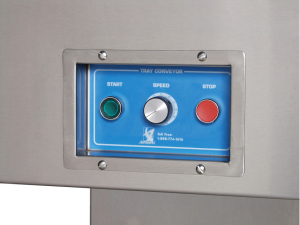 A photo-electric sensor is located at discharge end of conveyor to stop the conveyor when activated by a tray. Conveyor re-starts when tray is removed.